Get a reduction and free UK p&p on single orders of our books. Offer applied at checkout. How to Handle Later Life ranges over the main issues faced as you grow older, from choice of housing to financial matters, social contact, healthcare, transport and legal questions. The wider context of the ageing body and its changing nutritional, exercise and psychological needs is also examined. Discerning, straight-talking and completely unique, How to Handle Later Life prepares us for problems many people have preferred not to think about. Although aimed primarily at older people and their families, this book is also invaluable for professionals working in the expanding field of later life, not least social workers, doctors, psychiatrists, care managers, retirement housing managers, nurses, financial advisors and solicitors. All of these people can find it useful to know what other professionals actually do. They may also benefit from finding out what guidance is being provided to consumers on how to handle members of their own profession. Marion Shoard is the author of seminal works on environmental issues including The Theft of the Countryside and A Right to Roam. When she turned 50, her mother lost her sight and developed dementia. She searched for information she suddenly needed urgently but in vain. So she decided to write a book that would prepare everyone for the final decades of life. Further information about the author can be found on Wikipedia and her own site. Reviews of How to Handle Later Life are beginning to come in. William Leith in the Evening Standard describes the book as “Unique, essential and considerate”. Read his full review published on 31 August 2017 here. In the Methodist Recorder The Reverend Albert Jewell explains: “Shoard addresses in a thorough-going and balanced manner the biggest concerns and decisions people face as they grow older.” Describing the book as “reliable and comprehensive”, he goes on, “It should be found in every public library.” Jewell especially commends the section on dementia: “As someone who has been involved in dementia care and research over the years, I find the author’s chapter on this subject particularly impressive. Its 25 pages are essential reading ...” Read the full review published on 1 September 2017 here. Third Age Matters is the magazine of the University of the Third Age. Its reviewer, Eric Midwinter, co-founder of the U3A in the UK, considers: “It would be difficult to visualise a more complete and wide-ranging compendium than this on how to cope with the pressures and perils of later age. ... Health, with more than 200 pages, housing, legal matters, finance and all other facets of later life are comprehensively and sympathetically treated, with a user-friendly structure and presentation. There should be a copy in every library, council office, doctor’s practice, MP’s surgery, Citizens Advice Bureau, Age UK office, if not in every household.” Read the full review published on 15 February 2018 here. Daniel Collerton is consultant clinical psychologist at Bensham Hospital, Gateshead. He writes in a review published in the journal Psychology of Older People: “This is a big book: large in scope and ambition. In some thousand pages in 41 chapters, Marion Shoard sets out with the task of enabling readers to live as happily and healthily as possible. I think she succeeds pretty well. … It is the best collection of sound advice that I have come across. On the clinical level, I do not doubt its usefulness for any department working with older people.” Read the full review here. 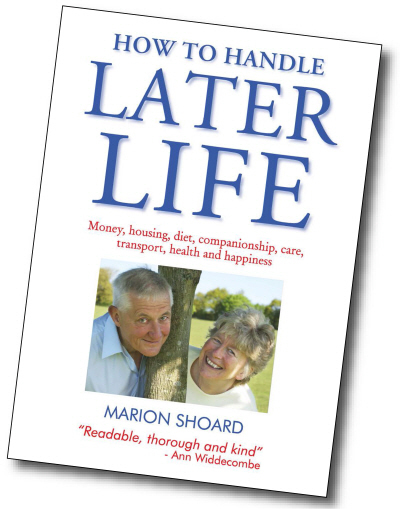 In 2004, Marion Shoard wrote A Survival Guide to Later Life. Her new book, How to Handle Later Life, replaces this earlier work, deepening and updating its coverage and extending into new areas.